The D.C. Travel and Adventure Show is an annual event which takes place early in the year. Three of the eight annual Travel and Adventure Shows are held in California. Philadelphia hosts the only other one on the east coast. Started in 2004, the Travel and Adventure Shows offer a mix of exhibitors from around the world and celebrity speakers with some culture-focused entertainment thrown in for good measure. The 2017 D.C. show featured speeches followed by meet and greets with Samantha Brown, Pauline Frommer, Peter Greenberg, Jack Maxwell and Patricia Schultz. Samantha Brown and Peter Greenberg appeared on both days. 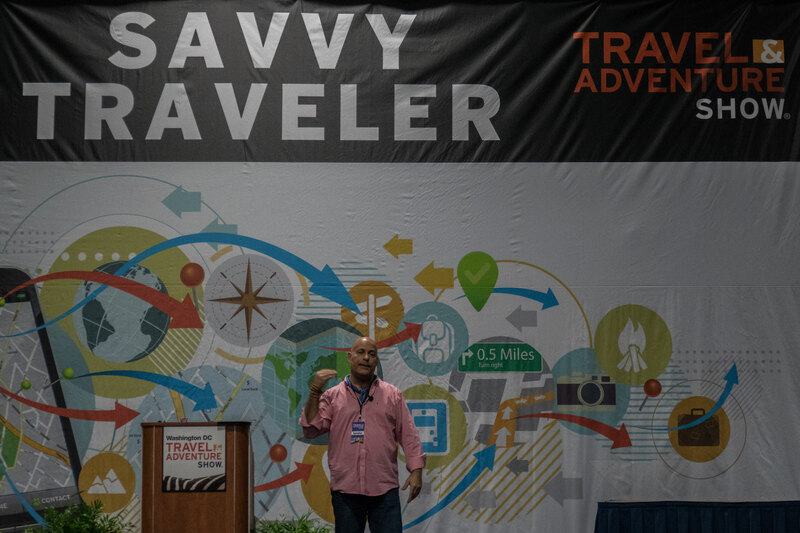 Peter Greenberg kicked off both days in the Travel Theater with his “Travel in a Time of Disruption” seminar. The CBS News Travel Editor gave some helpful tips on finding a room. His response when there are no more rooms available: “Would you have a room available if the President of the United States showed up?” While most of us would not think to ask for an “out of order” room, Peter knows all the tricks. Perhaps the most useful advice he offered was to never travel without medical evacuation insurance. Four first class seats and a nurse can easily cost more than an automobile! As you can probably imagine, Samantha Brown’s “Lessons Learned from a Life Lived on the Road” was the most lighthearted of the celebrity speeches. The Travel Channel host managed to describe the frustrations of her “job” without ever getting too serious. The 161 hours of television shows in which she appears took over 23,000 hours to create. 17 hour days are the norm for Samantha Brown. Her “lessons learned” (that’s an Alice in Chains song) are that every place has a soul (not just Korea) and that you must enjoy the mundane. When she arrives in a new destination her rituals include going for a walk with no maps or apps and then starting every day at the same coffee shop (that’s a Red Hot Chili Peppers song) in order to feel the pulse of a destination. Another Travel Channel host (Jack Maxwell) was followed by Pauline Frommer, Editorial Director of Frommer Guides. Pauline considers herself to be a consumer advocate first and foremost. Her Ralph Naderesque speech focused on brands “scraping” for your buying habits. As she’s been doing for years, Pauline stressed the importance of erasing your browsing history and removing cookies. Anyone who frequently books flights can probably recall at least one instance where they searched for a flight, went to do something else and then noticed an increase in the price 30 minutes later. She went over other upcoming changes such as airlines trying to make more and more money on the back end as well as airlines offering points for how much you spend rather than how many miles you fly. Like Peter Greenberg before her, Pauline reiterated the fact that insuring a flight or hotel is usually a waste of money. If you fly once a month and spend $75 to insure each flight, that’s $900 in a year. You can fly almost anywhere in the United States as well as parts of Southeast Asia and Latin America for less! Perhaps her most shocking statement was that the bagels in Montreal are better than the ones in New York. That’s coming from a lifelong New Yorker! Georgetown alumni Patricia Schultz closed out the final day of the show discussing her most recent book 1,000 Places to See in the United States and Canada Before You Die. Her first book 1,000 Places to See Before You Die took eight years to write and had a working title of 100 Drop Dead Places. While most of her speech focused on North America, she did talk about living in Italy as well as the importance of seeing Iceland in the summer. As Pauline Frommer mentioned, 2017 will be the year to see the northern lights as opposed to any time between 2018 and 2028. The destination theater featured 30 minute seminars on travel to Eeyou Istchee, The Bahamas, US Virgin Islands, North Carolina, Tanzania, Thailand, Alaska and Israel. There were also presentations by brands like Travels with Audrey, Cruise Planners, Dream Yacht Charters and Intrepid Travel. Each destination presented the audience with some interesting facts. For example, Anchorage has a Jewish history museum and no sales tax. The state of Alaska has 11 different ethnic groups. Israel has six different climate zones and the highest per captia startups. Their passport control officers stopped stamping passports years ago due to issues with entering other Middle Eastern countries with an Israeli stamp on your passport. Intrepid Travel focuses on the niche between luxury and backpacker travel. Brand and Partnership Manager, Joni Taisey helped debunk myths about group travel. Her presentation spoke particularly well to solo travelers. One of the “myths” is that you will be a third wheel if you go solo on a group tour. Her most compelling point was that a guidebook can never replace a local guide. She used her own story about learning more from a week in Colombia with a local guide than during a whole month traveling solo through Portugal. Presentations in the Savvy Traveler Theater featured more practical advice. Most focused on a travel niche. The notable exception was Lee Abbamonte who would have been better placed in the Travel Theater. He has after all, seen more countries than anyone who spoke in the Travel Theater. Angel Castellanos spoke about packing, while Ralph Velasco offered photography tips and a free autographed book to one lucky audience member. His tips included “always look at the background” and “it’s not about the camera.” Some of the pics on display were taken with an iPhone. He stressed the importance of the magic hour and encouraged anyone who doesn’t like to wake up early to be a writer. There were also presentations on cruises as well as LGBT and family travel. The most fun and interactive part of the show was the Taste of Travel Theater. Chef Matt McMillin from Cooper’s Hawk served as the Event MC. 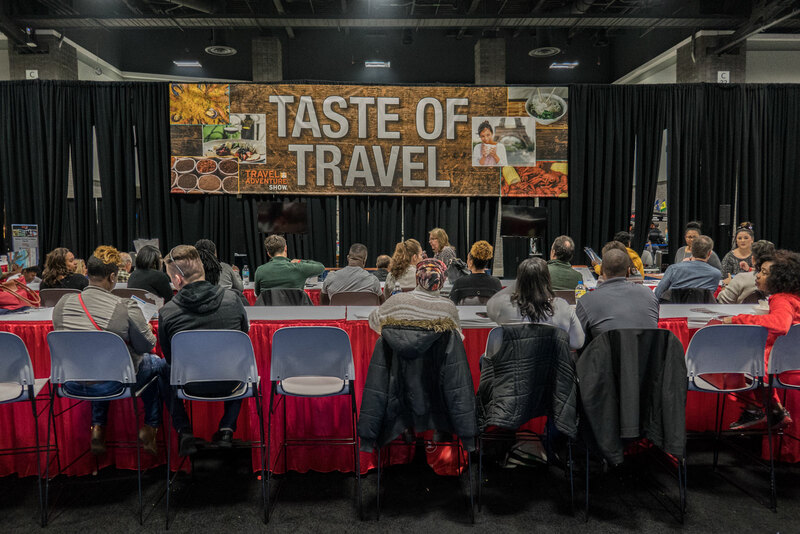 Chefs from local restaurants demonstrated how to prepare dishes like short rib with creamy yellow polenta, spicy tuna sushi, tomato bruschetta and Italian cheesecake. Chef Sherene James from the Jamaica Tourist Board demonstrated how to make jerk salmon with tropical salsa on both days. Chef Guillermo Pernot from Cuba Libre Restaurant & Rum Bar shared his chicken croqueta recipe. The Global Beats Stage covered music and dancing from every continent except for Australia and Antarctica. Although it wasn’t too cold for Metallica to rock out in Antarctica, a world captivating dance craze is yet to make it out of the frozen continent. Furthermore, AC/DC and Kylie Minogue were unavailable to represent Australia. The Argentine department of tourism brought Flamenco, while Europe was solely represented by the Irish. The Americas were also represented by the Bahamas and Bolivia. Sahara Dance presented Egyptian and Middle Eastern dancing, including belly dancing. 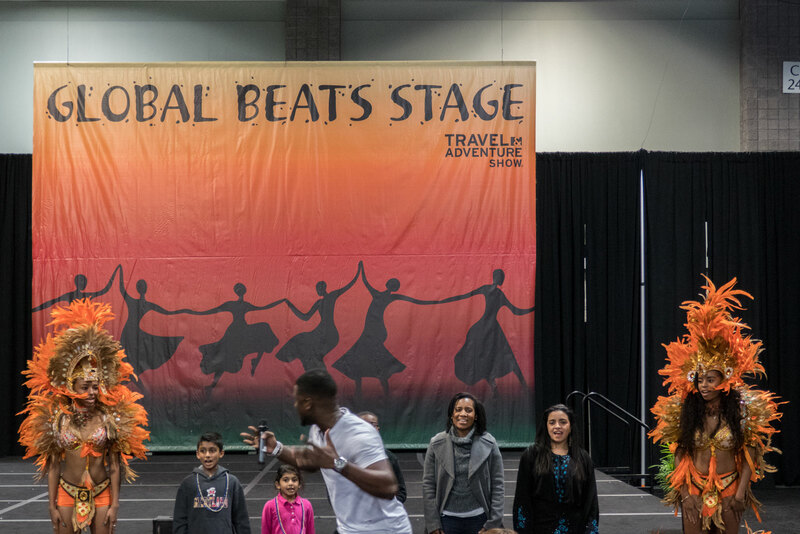 India was the sole Asian country represented on the Global Beats stage, while Rhythms of Kalahari closed out the final day with Dances from Botswana. Have you attended a Travel and Adventure Show? If so, where? If not, would you consider attending one in the future? I’d have loved the “Lessons Learned from a Life Lived on the Road” talk. Having just flown in from Africa just yesterday, my eyes have opened as to how much you can learn out and about! I have been wanting to addend one of these! It sounds like it was a really fun and valuable experience. I’m thinking now that we will attend the Tbex show in Ireland later this year, have you ever been to one of those? Attended TBEX in Stockholm last summer. I’ll be at TBEX in Jerusalem and the New York Times Travel Show as well. If you need advice on TBEX, let me know. What a wonderful experience you had. I’m guessing you were able to meet Samantha Brown. I used to watch her shows on Travel Network. I’m jealous. I actually had a chance to talk to Samantha Brown for a couple minutes. Turn out we are both going to see U2 this summer. Sounds like a great show! I’m sure you were able to make lots of great connections. How long did the show last? Were you able to see DC at all? Hi Brianna! This trip left little time for exploring DC. The show is always on a Saturday & Sunday. I did eat great food after the show closed (both days). Lao on Saturday, Ethiopian on Sunday. This is actually my first time hearing about a travel/ adventure show but I really like its philosophy! Sign me up! Ana, you been to United States? What a great post. I’ve never heard of the travel and adventure show .. but it sounds like a lot of fun. Thanks so much for sharing! I am so game for travel conventions like this one! You get to hear insights from very lovely people, like Samantha Brown! That’s already great, then you get to taste food and learn more about traveling. Everything that’s part of this show will inspire you to go out and travel more. I’ve never heard of this show, so now it is on my radar. It sounds like a very travel worthy show with a fab line up of industry pros with insightful travel tips, and a great way to connect with destinations and other travelers. Must he so cool to attend! I grew up reading or watching this “travel celebrities”. Samantha Brown is really nice. I have never heard of the travel and adventure show before. Sounds interesting. I would love to see and visit one. Apparently I need to get out more because I didn’t even know these travel trade shows were a “thing.” Looks like a fun event. Do visitors have the chance to meet the speakers in person? Most useful info in this is –> “2017 will be the year to see the northern lights as opposed to any time between 2018 and 2028.” Yee HAW! We’re planning a trip to Iceland this year before we leave Europe. Northern Lights, here we come! Enjoy Iceland. Still haven’t been. You get a chance to meet most of the speakers in the Travel Theater after they speak. What a wonderful experience you had in the Travel show. I truly believe that these travel shows are quite enriching for travelers and writers , or for that matters for anyone who just loves to explore the world. I have attended a few in India and my experience in meeting people from different parts of the world, exchanging ideas and listening to the speech has been quite fascinating. I have neither been to TBEX nor at any travel shows. Though I attended some travel exhibitions which usually have some stall and some pamphlets are distributed. Guess I need to attednd the TBEX at least once for the sheer experience. I’ve never attended any Travel Show, but I’d like to attend one, maybe this year. Must be a great experience to meet other travellers and writers, and enjoy a bit the culture and the food from each of the continental. Travel and a adventure show seems like a really nice event to go! So sad I live so far from both California and Philadelphia! Wow this seems like such an amazing show to attend. I wonder if they have something in LA because I’d love to see the panels and learn more on travel. I have only attended the World Travel Market in London, last year, and I was overwhelmed by it. Even if it has a different format, I would love to visit the Travel and Adventure Show as well, it looks like a brilliant experience. That’s so cool you got to see Samantha Brown speak! I always enjoyed watching her as she always seem to just have fun traveling. It seems you had an amazing time here. We would love to be a part of such events. We plan to attend some of these in Europe this year. It is always an enriching experience to meet and listen to like minded people. I have no idea these existed lol. It sounds like a great experience! That sounds like an excellent event. We’d like to go to this one or another one like it in the future. I didnt know these existed but I’d love to see all these travel talks. I’ve never attended one before. It would be a good learning opportunity to listen and interact with the resource speakers who are authorities in their respective fields. Some culinary delights to sample and cultural shows from around the world to enjoy make this show a great experience for all its worth (now that’s a Buffalo Springfield song). It sounds like you had an amazing experience! We have not attended one before but would love to. Sounds like a fun event! Never even heard of such things, but I’d be interested in going to one in the future ! Travel shows sound like a great resource for gaining knowledge and networking. I am freaking out a little bit about the Northern Lights not being so good for the next ten years. I might have to try to get there asap. A lot of things to learn and hear there, obviously. Some interesting show. 😉 Thanks for the review! What a fun, inspiring and educational show to attend. I’ve never been to an industry sow like this but it seems you can learn so much. I wonder if there’s an equivalent in the UK. I’ll have to go and do some research now. I’d love to go to something like this! This is awesome, thanks for sharing so much about the travel show! I have not been to a travel show before, but it sounds incredibly interesting, and like a very good networking opportunity. Would you go back to the DC show, or do you think once is enough in a single location? Yes, I would go back because some of the people and seminars will change. I’ve never heard of this show. I’ve to research more on this. Thanks for keep me posted on this event. OMG this looks like so much fun!! That beats part of it brings a whole new edge I feel. I have been meaning to book some kind of travel expo or conference! Where did you hear about this? I attended the New York Times Travel Show in 2012. I found out the others I’ve attended since (LA Times, Philadelphia Inquirer, etc.) by following speakers like Rick Steves and seeing where they spoke. You are from Georgia? I’m not aware of any in that area. Dallas Travel & Adventure would be the closest that I’m aware of. Feel free to contact me if you need more advice. Bon Voyage! Wow, surely it was a really nice experience 🙂 actually I’ve never heard about this travel show before, but it looks really interesting. Do you know when and where is next one? I’m new to the travel industry, so this is my first time hearing about the DC Travel & Adventure Show! I’ll have to look into next year’s show. Also, I’m curious as to why 2017 is the best year to see the Northern Lights versus 2018 to 2028? This is awesome! I would totally geek out at an event like this. I didn’t even know there was such a thing as Travel trade shows. I hope you were able to network with a lot of people. I hope they bring this kind of event to Italy! Love seeing a piece about my city! I’ve been to this tradeshow – it’s an absolutely blast. Hearing from Samantha Brown is always a pleasure, and the rest of it was very informative as well. This was like a travel bloggers paradise!